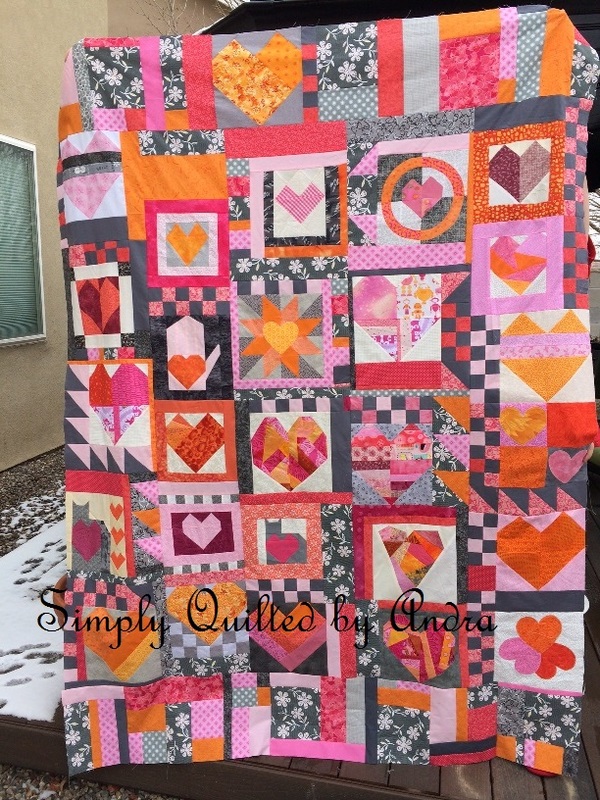 Here is a quilt top that I finally got around to making with the heart blocks I won years ago! I can’t wait to get it on the long arm and do some free motion quilting! I have a few hearts left over and I am not sure if they will go on the back or into a baby quilt. At least one of them will serve as my label, I think. If you recognize your block, I would love to hear from you. I wish I had thought to have you all sign them before you sent them. I think that should be one of the options for the winners to decide on-if they want them signed or not. I will probably be watching the Olympics tonight rather than loading a quilt though! I do have lots of binding work ready for hand stitching while I watch though. Wow! You did a great job of putting those blocks together. 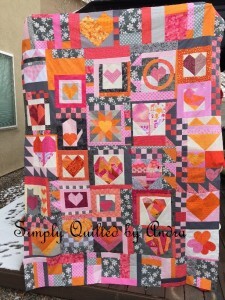 I made the heart in hand paper pieced block (that looks a little like a mitten with a heart on it. I love signed blocks, too, but honestly, have never been successful in block exchanges (or the lotto) when I asked everyone to sign their blocks for specific winners or participants. Nice! The arrangement is pleasing. This is beautiful!! I hadn’t realized BL had already done the pink/orange combo. I’m going to have to put this on my wish list. I see my heart blocks! This is amazing. Love what you did! !